I’m so excited to have Lee Merideth of do stuff! and leethal fame here to talk to us about which thrift store items she recommends upcycling into craft materials. She also drops a LOT of awesome project ideas and tutorials our way. Thanks so much, Lee! -Sweaters! 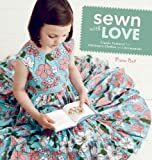 This is my number one category of craft stash – I unravel sweaters to recycle the yarn, I felt wool sweaters to use the felt, and I convert cotton (or otherwise non-felted) sweaters into new clothes or other projects. I choose my sweaters based on fiber content (essential when looking to felt, important for unraveling too, especially if planning to dye), color, feel, etc, depending on my plans for each one. -T-shirts! My favorite material for sewing projects, t-shirt fabric is soft and versatile. I use tees in all kinds of projects, from huge t-shirt quilts (well I’ve only made one of those, but it’s awesome! ), to clothes like skirts/shirts/dresses, to small projects like headbands and cuffs, or tee scraps as applique. I choose my thrift buys based on color, image, softness, and size (but often the color and image are great enough that size doesn’t matter, I’ll find something to use it for). -Sheets! This includes both full size bed sheets and pillowcases – there are so many things you can use sheet fabric for, if you see a pattern or color that grabs your eye, get it! You can use full sheets and pillowcases both for big-ish projects like skirts, bags, etc (I even did a roundup of tons of different pillowcase projects) and I love to have them around for smaller uses, like patches, applique, or other embellishments. When choosing sheets to buy, just pick the fabrics you love! -Clothes! Other clothes besides tees and sweaters can be great for fabric also, like sweatshirts, jeans, pants, skirts, tops, and shirts. I only buy these when the fabric is great, or if I have a specific project in mind and I know what I need. I like having several sweatshirts and jeans on hand though, as these can be great fabrics to work with. -Ties! Neck ties are a fantastic craft supply, as you can see in the roundup of tie projects I did awhile back, so I always grab cheap ones in good patterns when I find them. Several can be combined into a big project, or if you find one you really love you can make it into something special – I love using leftover bits for little appliques! -Books! I absolutely love the imagery in a lot of old science books from the 60’s and 70’s, as well as some old cookbooks, and of course there are the craft books! I’m sure to have some of these on hand for whenever I need some good imagery – I use them on cards, for CD sleeves, in decoupage projects… I’m not a big paper crafter, but it’s often useful to have my book stash! -Jewelry! My favorite kind of beads are recycled beads, so I always take a peek at the jewelry section to see if there are any cool looking beads on bracelets or necklaces that I can take apart. I don’t do tons of beadwork, but I do make myself earrings for fun, and I make beaded stitch markers for knitting, so I love having a stash of recycled beads for when the mood hits me. -Craft Supplies! Have to include this – not all thrift stores have a decent selection, but sometimes I’ll come across bags of buttons, yarn, thread… and if you’re into vintage sewing patterns, those are super common! So always take a look and grab what you think you’d want to use in future projects! Need more Lee? Show your support and check out her handspun yarn, cuff patterns, and cuff kits before you run off to empty your local thrift shop and start crafting like crazy. This entry was posted in Guests, Your Tip for Tuesday and tagged applique, decoupage, dye, handmade, lee meredith, pillowcase, recycle old sweaters into new clothes, recycle sweater yarn, reuse, t-shirt quilt, tie projects, upcycled craft materials, use wool felt. Bookmark the permalink. Pingback: do stuff! » can’t wait any longer to show you a preview!